Hand-selected gems inside this glass bottle take your everyday water up a notch. Hydration is key to being your healthiest self—but what if a special bottle could take your regular ol' water up a notch? Look no further, wellness-obsessed friends. Each of these sturdy, sustainable glass sippers features gems hand-selected for their believed beneficial properties: Amethyst (better sleep, better moods), rose quartz (positive energy, healing), and clear quartz (clearer mind, free-flowing energy). Not to mention, they're pretty cool to look at, too. Made in Germany. Thoroughly wash the water bottle before first use. The glass bottle is dishwasher safe. 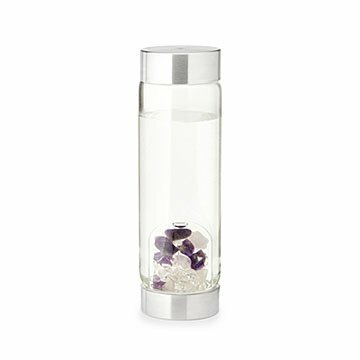 The gempod and caps are not dishwasher safe and must be hand washed with warm, soapy water. To clean, unscrew gempod from bottom cap. Allow all parts to dry completely. Do not open the specially sealed gempod.